Qualifications: Residency and fellowship: Bichat-Claude Bernard University Hospital, Paris, France. Consultant in neonatal endoscopy unit in Robert Debre, Paris, France. 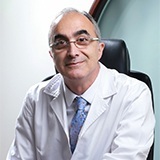 World expert in intragastric balloon (chairman of training center for the Middle East from 2004): more than 1700 cases since 2000. POSE Procedure - the first in the Middle East who did it and a world expert and pioneer in Pose Procedure having done more than 160 cases since September 2012. Internship: Pitie-Salpetriere University Hospital , Paris VI…………………..
Residency and fellowship: Bichat-Claude Bernard University Hospital, Paris, France.